The French Geographic Institute (IGN) and more and more data providers are delivering the ground in the form of ASC grids with small pixel size (1 m or even 10 cm). MithraSIG creates a ground as points and contour lines. The integration function converts grids (“ASC” format for example) into points. The major problem lies in the fact that the number of points produced is huge (several millions) and not very relevant in the zones of almost flat landscape where the ground has no effect on the acoustic propagation (outside the ground effect). Example: we have four ASC grids of 1000 x 1000 pixels with a pixel size of 1 m, that corresponds to four million points on 4 km². The new MithraSIG function reduces the number of points from these grids by considering a maximum tolerated difference chosen by the user between the initial and produced data. 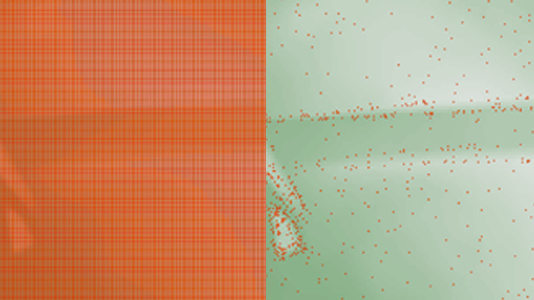 An altitude comparison is done for each point between a complete data triangulation and an approximate triangulation while remaining within the tolerance. The result thus obtained represents the feature points of the ground: ridges, peaks, valleys, slope breaks, and mounds. These are the points that we seek to identify and to model in acoustics. A tolerance of 20 cm divide the number of points by 250. The average deviation (with the original data) is 10 cm. With a tolerance of 1 m, there is an average loss of precision of 50 cm and a theoretical maximum loss of 1 m. We reduce the number of points by more than 2600. Comparisons are made with all the same calculation parameters. The average difference is made in absolute value in order to avoid that errors compensate each other. The differences of calculation with and without simplification of the ground are weak. 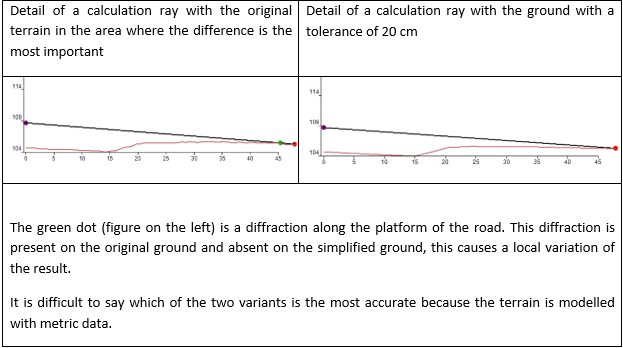 However, locally, one can find important differences: some rays appear as diffracted in one case and not on the other. This is especially true in the NMPB08 method where the height of the source is low (5 cm). 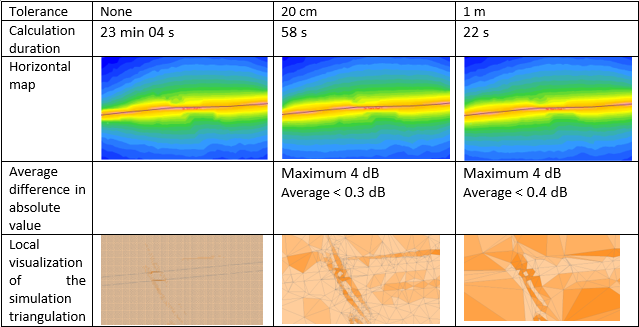 Simplification of the terrain depends on the wanted precision of the simulations: this precision varies between a city cartography and an environmental impact study. We calculate from ray tracing: details below the wavelength (less than 10 cm) do not improve the precision of the simulations. We advise to always simplify the data (with a tolerance of 10 or 20 cm) which significantly reduces the number of points and computation time without altering the results. What is Open Data? In few words, Open Data is “data that can be freely accessed, modified and shared by anyone”. Data can come from various public or private sources: governments, local authorities, communities, companies, NGO, etc. Many websites like opendefinition.org give a more detailed definition. Creative Commons (CC) which is more intended for creative content, Open Data Commons Public Domain Dedication and Licence (PDDL) and Open Data Commons Open Database License (ODbL) dedicated to databases. Governments providing data can create their own licences. For example, the United Kingdom has the Open Government Licence (OGL), Germany with DL-DE licences and even Europe with the EUPL licence. A list of these licences can be found on the website www.europeandataportal.eu. France has created its own licence « licence ouverte » (LO) based on the project Etalab that many cities have adopted. With this licence, it is possible to reproduce, modify, redistribute and use for commercial purposes provided that the source of the data and the date of the last update are mentioned. Open data is present in many areas: culture, education, transports, science, environment, economics, mapping and many others. Moreover, the Big Data increases the amount of data and their types. This make it possible to find many types of data: statistics, reports, images, geometries, etc. All the data can be useful because even if a type may not be relevant alone, combined to another type of data, the value of the result can be very important. That is the strength of Open Data. For GIS (Geographic Information System) and mapping software fields, the data is provided mostly by public entities. The French government makes the data available through its platform from the project Etalab. Today, more and more regions, conurbation or cities are making data available through their own platform. 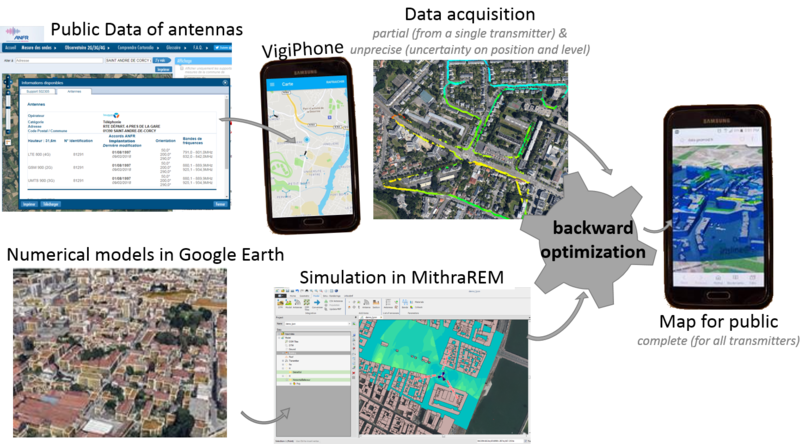 This data can contain the ground (LIDAR survey, DTM, contour lines), 2D or 3D buildings, roads and railways, vegetation or water areas, backdrops, and others. This data is a rich and valuable resource to build its digital models that can be used in modelling software. To ensure the best compatibility between all users, the data is mostly in formats allowing to import and export in many software. For that purpose, there are files or web services. CSV format that can be used as “table join” in a GIS software. KML, GeoJSON, SHP formats that can be used for vector data. 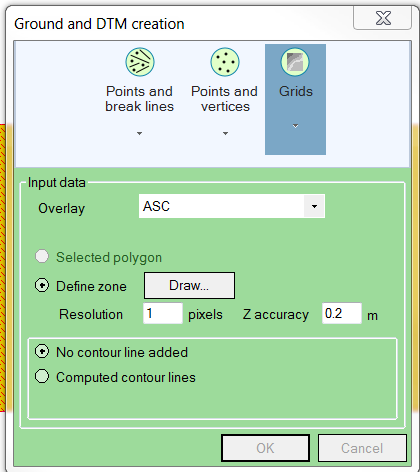 GeoTIFF and ASC formats for raster or meshing data. Other formats exist but are less common today like GML or CityGML for 3D data, XML or GPKG. However, this is changing and they may become standards in the future. Nevertheless, this is not always interesting to download the data as files for various reasons: the file can be too large, the data is too frequently updated, the amount of data to be displayed is too high, etc. In these cases, a web service or an API is a better solution to have access to the data. In web service, there are the Web Map Service (WMS) or Web Feature Service (WFS), both standards of the OGC. These services provide georeferenced images for WMS or georeferenced geographic data for WFS. Where to find Open Data? Today, we can easily find Open Data on the internet. In recent years, it is a wish to share data for information, knowledge and transparency purposes. The French government has its own platforms data.gouv.fr or geo.data.gouv.fr. You can find cadastral data, statistics on energy or population, roads axis, landmarks, etc. The cities of France also have their own service providing data directly about the city, the districts, the population, etc. This is the case for Paris, Lyon, Strasbourg for example. Regions have also their platform such as Grand Paris, PIGMA for Nouvelle-Aquitaine, or the region Provence Alpes Côte d’Azur. Another major website for France is OpenData France which is an association aiming at “regrouping and supporting local authorities engaged in a process of opening public data and promoting all the process taken by these local authorities, in the purpose of the promotion of Open Data”. It includes the list of members of this association and in particular the local authorities with the link to their Open Data platforms. There are also essential services like Open Street Map, which relies on a community of people from all fields to expand the project. It is worth noting that most of the important contributors are the governments themselves. And other cities in the world also have their program for Open Data such as Geneva, Brussels, New York, or Europe and United-States. Obviously, it is difficult to navigate among all the possibilities to obtain data. Fortunately, there are websites that include all the portals available in the world. 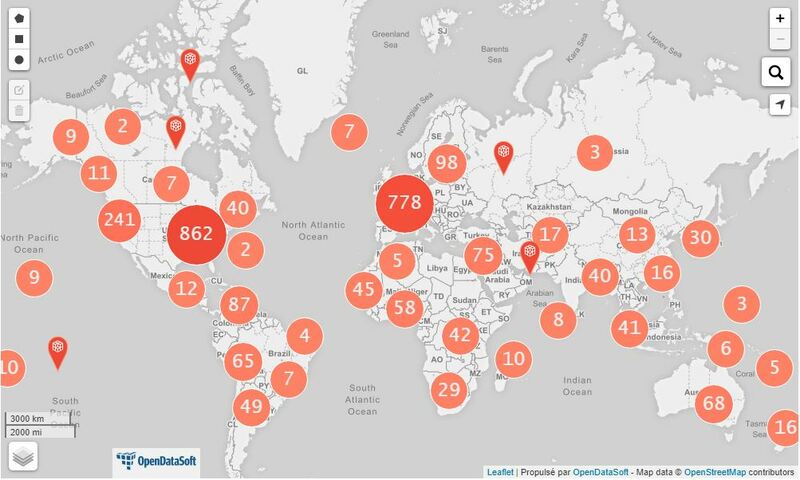 This is the case of OpenDataSoft where you can browse a map of the world and find a portal.